In a case of Internet intelligence that makes the tricks of double agent Cold War operatives seem like childish play, Bing has been caught stealing search results from Google with its Bing toolbar and IE8’s Suggested Sites feature. Google first suspected unclean play in May 2010. 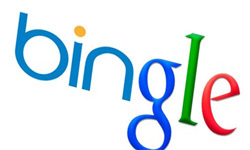 By October 2010, with Bing results started to look alike Google’s, it knew something had to be made about it – and so, in true, nerdtastic style, Google set up a sting to show that Microsoft was actually behind the general impressions of Google generated search results. Google injected “synthetic” results into its search engine – some fake queries and results that no real user or engine would ever generate. Then, on D-Day, December 17, about 20 Google engineers were asked to run the test queries with Internet Explorer 8, Bing Bar and Suggested Sites. By December 31, some of these fake results began appearing on Bing just like Google has. See the examples after the break – it’s damning. For a full discussion of Bing’s behavior, and what impact Microsoft might have to face, read the original post at Search Engine Land. Great post but I think it would be prudent to re-word it so more people will catch your wit! Your article was very interesting. Great write-up. Much appreciated.Thank you for the wonderful article. Thought provoking stuff. Thanks.